I am a qualified mechanic and have 12 years experience working on various makes and models in the uk. I have worked for a range of garages from main dealers to small independent firms. I am also an Mot tester and a member of the IMI. The mobile service is primarily designed to get jobs done quickly thus getting you back on the road saving you time and money. I can carry out a range of repairs from simple servicing to major gearbox repairs. I am extremely passionate about my job and take a pride in my work making sure the vehicle is repaired properly and to a high standard. I always use good quality parts, locally sourced and offer a warranty on all work carried out regardless of whether I supply the parts or not. No matter what the problem or how big the task I will always try and help you where I can. Andrew was very professional, and all work was carried out neatly and within the time specified. 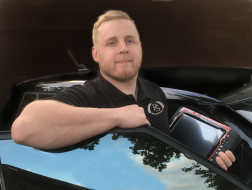 Andrew was very professional and informative of repairs undertaken on my vehicle, I would highly recommend him to anyone who is a little unsure of who to undertake any repairs, I will be recommending him moving forward. Sadlly i didn't get to meet Andrew but in my phone conversations with him he came across as extremely friendly and knowledgeable guy. Andrew was excellent. The job of changing the clutch on my Fiat Ducato was a heavy, physical job, not really suited to just one man in a car park. Not only that but there were unexpected problems with the replacement clutch which made the job very much harder. Andrew was just exceptional, given the problems he faced & I recommend him wholeheartedly. Andrew arrived bang on time, was very friendly & got on with the job with the minimum of fuss. He was very methodical & clean. I would highly recommend him to anyone. Andrew was excellent , knowledgable and very helpful in explaining the work carried out. Came to the house to service the car and change cambelt . Would highly recommend to anyone needing work done. Great Job! Andrew was diligent and worked at speed. Provided a good explanation of the work carried out and answered all my questions.